Below are a few excerpts from a terrific UK site by Darren Meldrum TV Test patterns from around the world. Darren’s site includes test patterns from the BBC, Australia, Singapore, Ireland, Sweden, North America and lots more. 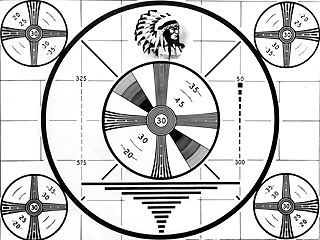 Probably the most famous American B&W test pattern is the so-called “Indian Head” monoscope pattern. This pattern was originated by RCA in 1939; it was designed to be generated using a special tube called a monoscope, a CRT which had a metal plate target on which the pattern was printed. The black lines of the pattern would interrupt current flow as the pattern was scanned to provide the desired video output. These tubes could only handle black and white – no shades of gray hence they had to be simulated either with a halftone dot pattern or with patterns of fine lines. This is the 16:9 PAL version of the Philips PM5644 test pattern as used by BRT, the Dutch-language Belgian broadcast organization. Really cool! If only you guys would find an old test card for the Emergency Broadcast System from the 1960’s-70’s. Now THAT would be rad! I remember the old EBS Test Pattern.It had the old”CD” White Triangle in a blue dot and the letters were in Red.Lots of stations even did a jingle along with the attention signal.Those were the days now gone by with time. Re the NBC test pattern: 1947 was the year when the wedge calibration dots, their size and their position were modified. That particular variation seemed to be for internal consumption, as I did not see any evidence of this pattern in that form being used on the air. The copyright notice on the outer lower right quadrant was only used on NBC-owned stations.